When we take our seats in Adelaide's Festival Theatre the air is already thick with haze. Its density suggests something ominous, a kind of collapse. A single, melancholic musical line pierces through the darkness as a body in motion comes into focus. While the work's title might suggest something rousing and operatic with a clear narrative and heroic resolution, this is anything but that. It's as if we're witnessing something big, but don't know what. We are silent spectators to something terrible unfolding, a global catastrophe, possibly a literal 'grand finale' for the species. Designer Tom Scutt's enormous but remarkably mobile panels, which can look like giant concrete walls, are manipulated by dancers from behind, creating the spaces that shape and contain movement. They are co-actors in the unfolding drama, back drops, places of refuge and of no escape, prehistoric monoliths used for unknown rituals, even monstrous, menacing grave markers. Like other works by Shechter, notably Political Mother and In Your Rooms, Grand Finale is highly percussive, with beats activating human movement, which at times becomes frantic, even painfully frenetic. In this work he adds an onstage string quartet with two cellos, a violin, and an acoustic guitar. The musicians seem to disappear and reappear in different areas of the stage, thanks to Tom Visser's magical lighting. 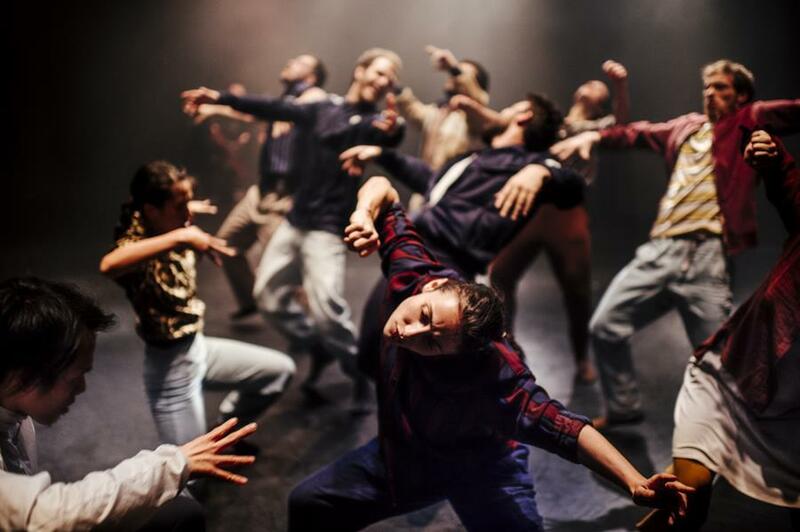 Because of the way sound, light, movement, and percussion come together, Shechter's choreography can be almost trance-inducing in its intensity and relentlessness. It can seem to invoke the ecstatic, as if dancers were seeking to connect with some higher power, springing up and down, arms splayed out, their hands reaching for something beyond the reach of mere mortals. It's as if they're dancing in and around a ruined world. Suddenly all stop to stare at a couple kissing against a slice of the wall, an unexpected and unprecedented act of intimacy.